Communication Breakdown: Morland Blanchard TRA has complained of being “left in the dark”. Photograph: Julian Blake. 1-46 Morland Estate has been behind scaffolding since decorative brickwork fell 100 feet from the top of the tower on 23 November 2017, landing close to the entrance of a primary school. Members of the Morland Blanchard Tenants and Residents Association (MBTRA) had demanded clarity from the council on the planned repairs. In a 10 August letter, the MBTRA asked to see historic surveys of the building ahead of a ‘Section 20′ consultation on the repairs’ cost which had been due to open on 31 August. The MBTRA also asked for support from the council on immediately pressing issues caused by the scaffolding, including ventilation and mould problems, a lack of light, and pests. However, in a response two weeks later, the council made no reference to these requests of the MBTRA, and has since confirmed that the consultation’s opening has been postponed to a date within the next two weeks. In response to questions from the Citizen, a council spokesperson said: “At an 8 August TRA meeting, we suggested the Section 20 notices would be issued by the preliminary date of 31 August. “We’re sorry that this hasn’t happened. However, this is a highly unusual and complex project and it is important the works are scoped properly and accurately, ensuring the best outcomes, and value for money for the council and leaseholders. “We have been in touch with the TRA to apologise for the delay in getting back to them. This was partly caused by a change in staffing. “We will issue the Section 20s as soon as possible. Leaseholders will be issued with an outline of works, reasons for the works, and the expected costs. “We will also ensure the TRA is provided with our historic data before the Section 20s are issued. “Faithorn Farrell Timms (FFT) has been commissioned by the council to carry out a structural engineer’s survey. It is thought that repairs will include the installation of around ten specialist fixing ties in each 3x6m section of brick wall, installing prefabricated stainless steel angle brackets at each floor level, and re-fixing decorative concrete panels. Whilst the cost of the upcoming works remains unclear, the bill will be spread over Morland tower’s 46 flats. Hackney Council will cover the cost on behalf of its 41 tenants, whilst recharging the five remaining leaseholders for their share. Following council checks immediately following the falling of the brickwork, it is understood that Morland tower itself is structurally sound and safe. 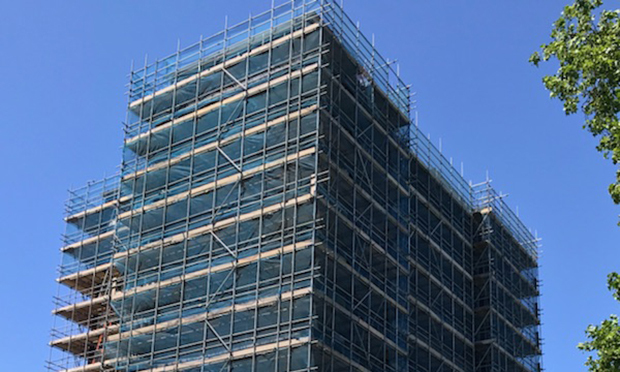 In response to the council’s statement of apology for the communication breakdown, Julian Blake, chair of the MBTRA, said: “With the lack of ventilation and lighting [caused by the scaffolding], tower residents are literally being kept in the dark. “Owners aren’t eager to receive the Section 20 notices, obviously, but as 31 August is the deadline the council gave, this adds to the stress and anxiety. “At the resident meeting the council promised transparency, but precisely nothing is clear right now except uncertainty. “We know the council is stretched and understand that if the lead officer leaves the council, as has happened here, there could be delays. “The bigger question is, why has Morland tower had to get this bad, with people nearly killed by falling bricks, before the council decided to act? “Corrosion is entirely predictable and should have been picked up years ago. “We welcome that the council says ‘it is important the works are scoped properly and accurately, ensuring the best outcomes, and value for money for the Council and leaseholders’. The MBTRA went on to call for the independent survey to be carried out by a ‘single joint expert’, who would be answerable to both council and residents. Blake said: “We welcome that the council has agreed to further survey work. “We have asked and continue to ask for a fully independent ‘single joint expert’ to give residents and the council both clarity and certainty of independence. “The council wants residents to be confident in all this, so why are they rejecting the single joint expert? “It’s good that the council says it will provide us with historic data. If it’s detailed enough it should tell us all what the council knew and did not know about the state of the brickwork before the collapse.